Do you see things on blogs and pinterest and wish you knew how to make them? 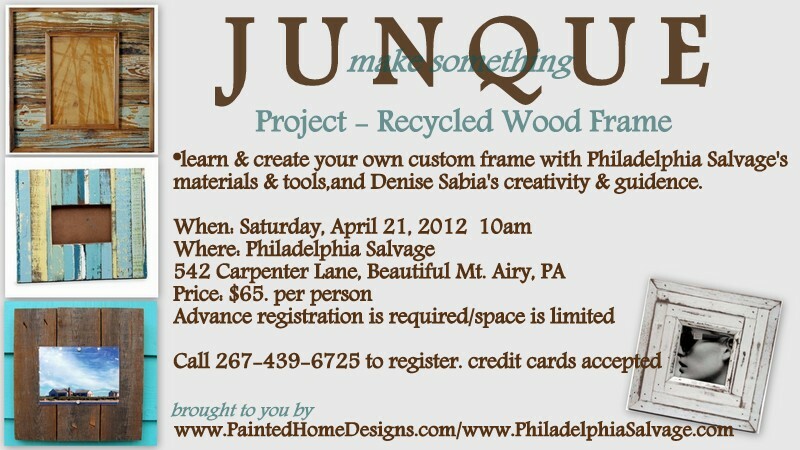 I’m really excited to announce a partnership with The Painted Home & Philadelphia Salvage. Philadelphia Salvage is Philadelphia’s first salvage and artist studio. They specialize in reclaiming pieces of Philadelphia’s history through re-purposing architectural pieces and building supplies. I used many pieces from Philadelphia Salvage in my designer room at The Philadelphia Home Show. From antique furniture, to old school lighting, to vintage bead board, they’ve got it all. They even have full time carpenters on staff if you’d like to use something they have in stock in your own home, just ask and they make arrangements to install it for you. It a must stop if your ever in the Philly area. So, with all that being said, how could I not spend my weekends there buying up all their bits and scraps to create my own “junque”? Well, I do, and now you can too. Once a month we’ll be holding a workshop series right in Philadelphia Salvage’s warehouse. Each month’s workshop will have a different theme. this month is recycled wood frames. You’ll use materials from P.S.’s huge stock of reclaimed wood, along with their tools to create your own one of a kind frame. And I’ll be there to help you along. Sign up soon, space is limited! Nice Decorating our House he look like so beautiful and attractive thank for sharing Awesome post. Absolutely love that dresser with the suitcases! Too cool! I've made a light fixture out of the globes, myself and it's not as easy at it looks. They look great in that space! I really want to attend one of these workshops! Its such beautiful and amazing designer room. I like this room decoration and management of put things in proper way. Its really too good work.